While I don't blog often, and I don't always blog about teaching, I find that if something really is working well for my kiddos, then maybe I should share. 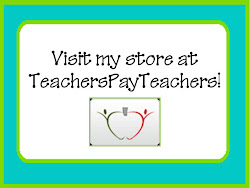 This post will not lead you to any fancy Teachers Pay Teachers items. If I'm industrious enough, I may be able to pull some signs together to add to my store for free, but that is not the purpose of this blog entry. Something I created over the summer is working well. Really well. So I thought I would share. I created a Literary Analysis Wall. And maybe I thought only a few students would use it, or enjoy it, but right now hands are up in my classroom throughout shared reading. If there is ANY downtime in my classroom, I am fielding a line of students who are excited to show me something about the book they are reading. To show you how much I lack as a blogger, I started this post back in December. That was when I had these fancy post-it notes that are so bright in color. But I ran out of those right around the time I ran out of spending money. Enter dollar store sticky notes. Anyhoo...It all started with an important part of shared reading. I read out loud while all of my students have a copy of the novel. (For more info on how I teach using novels instead of anthologies, I'm working on a post here.) First of all, I always read ahead of my students, whether I've read the book before or not. I make notes in my book before I read it with them, while I read it with them, after I read it with them, over the summer when I take the book home, etc., etc., etc.... My point is that the more experience you have with a novel as a teacher, the more the kids will get out of it. It helps if you love the book as well. "Wow! What an awesome example of excellent writing. I love how the author compared Josie to a statue. And notice how she wrote "Josie was a statue standing above me..." Did she even have to use 'like' or 'as'? I wonder what that kind of writing is called when an author compares two unlike things without using 'like' or 'as' -- HANDS UP ALL OVER. Then, I pick someone with their hand up and they tell me it's a metaphor (hopefully, they do. They are still kids, and sometimes they get these things confused, so we use all of it as a teaching moment). 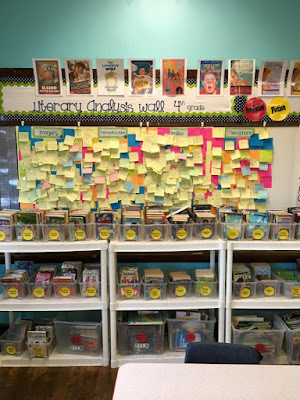 Once we've all figured it out, that student gets a sticky note, writes the title of the book, the quote from the book, and their name. Then they hang it on the appropriate section of the wall. Now that we are in June (and this probably started in November), I don't even need to stop. Hands just shoot up during shared reading. We stopped so much that some days I have kids keep their notebook open and they just write the page number and go back when we are done to tell me, so we can just keep reading. And then it gets better. Every.Single.Day. at least twelve students are standing next to me with their own independent reading books open to show me a literary device. Sometimes they have it, and sometimes they are close, but their imagery example is not juicy enough. High level readers, on level readers, low level readers, COMBINED. One parent actually told me during my last conference with her that she was yelling at her daughter one night. She told her she was acting like some animal I can't recall at this moment. 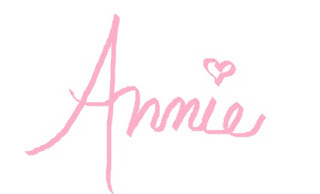 Her daughter whipped her head around and screamed back, "THAT'S A SIMILE!" We all shared a laugh, while I silently cheered for that little girl who has come a long way since she started at my school in September. The bottom line is that my fourth graders (who will become my fifth graders) are paying close attention to their books. They are in tune with what they are reading. And, a few seconds with one child will sometimes help me help them realize that an example may seem like imagery, but it's really just a detailed description versus a description with sensory words.